Island Image's bright tropical tees are a great way to live the Island Life all year long! For divers, there are bright, colorful tees featuring dive flags, dive tanks, wrecks, island locales and of course, all the wonderful creatures we love to see during our bottom time. Check out our Goliath Grouper for the Caribbean and East Coast locations and garibaldi, seals, leopard sharks and California bat rays in Kelp Forest for West Coast locations. For the South Pacific there are lionfish designs, clownfish, anemone. Florida and Caribbean trips and destinations will appreciate the whale shark, rays, dolphins, sharks, sea turtles, queen angelfish, seahorses, octopus, lobsters, manatees, and reef fish from all over the world. Have fun with our tropical pirate and diving parrots, and live dive history with the historic wrecks and working diver designs. Our popular Work Hard, Dive Harder (or alternatively, Work Hard, Play Harder) tee and our other tropical designs will take you to your favorite island locale every time you wear it. (Please note we are closed for 10 days for vacation every September and for 7 days for DEMA every November.) Browse our retail store on-line by clicking here. 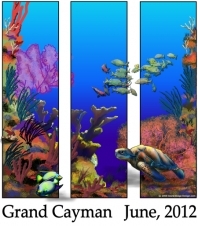 For the dive professional, Island Image's designs are an excellent way to add color and life to your retail store and a great value-added incentive for dive travel. Our new featured program for caps includes free digitizing and a choice of 32 cap colors. (There is no setup on these, but there ARE minimums. Call for info.) Our NO MINIMUM, NO SETUP program allows you to carry a number of styles without blowing your budget, and also allows even small groups to be fashion plates for you and for your sponsored dive trips, dive travel, awareness projects and liveaboards. 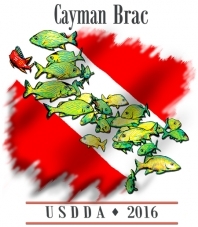 Dive professionals, don't forget your staff and crew! You can have a smart, coordinated look without investing a fortune. Buy only what you need when you need it. No need to stock a big inventory just for future staff needs when all you have to do is order when you have a new hire. Do you own a boat? Be sure to check out our boating and yachting page here. All designs can be customized with your logo or trips, or to commemorate your favorite dives. Add your trips, your company, training events, awareness projects or fundraisers to any design. Want to highlight your dive boat? We have done a number of dive boats over the years. Click here to learn about our boating and yacht designs. Got fresh ideas of your own? Bring them to us and we can bring them to life for you! Our artists stand ready to bring YOUR great design concepts to life for you. Simply call us at 305.295.8061 or you can email us and we'll respond quickly and professionally to help your dive and tropical ideas bounce to life. We're constantly adding new designs so please check back often!